Carl Gustav Jung was an accomplished Swiss psychotherapist as well as the psychiatrist who laid the foundation of analytic psychology. He formulated the theories of introverted and extroverted personality traits and differentiated them. His works have played an influential role in psychiatry, religion and literature studies. Individuation is the underlying concept in analytical psychology which is related to the connection between the conscious and unconscious. According to Jung individuation plays a major role in human development. He was known to have founded some of the well known psychological concept which included collective unconscious, complex and synchronicity. One of the most popular and widely applicable personality test Myers-Briggs type indicator is designed and developed based on the theories of Jung. Born on 26th July 1875 Thurgau, Switzerland he spent a rather depressed childhood. He showed no interest in studying psychology until he read about psychoses as personality diseases in psychiatry textbook. Jung also came to know that biological and spiritual factors are combined together in psychoses. That triggered his interest and inspired him to acquire a degree in medicine from University of Basel. After which he started working for a psychiatric hospital in Zurich known as Burghölzli. He published his thesis in 1903 which was titled “On the Psychology and Pathology of So -Called Occult Phenomena”. His next publication “Studies in word-association” in 1906 started his friendship with Sigmund Freud which lasted till six years. This break up occurred in 1912 when Carl Gustav Jung published a book “Psychology of the Unconscious” which showed major differences with the theories of Sigmund Freud. According to the theories presented by him about the self, Carl Jung considered self realization to be one of the most significant goals of life. Self realization is a stage of life which makes a person selfless and brings him closer to nature and other people. Synchronicity is the linkage between two events that are meaningfully related to each other. 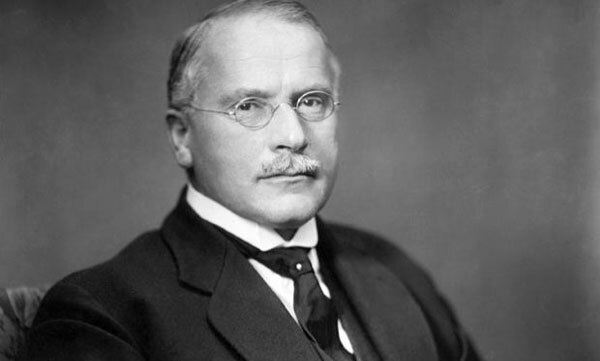 The theory of synchronicity presented by Jung indicated that there is a connection between collective unconscious of human beings. He also coined the most famous terms of introversion and extroversion as personality types, introverts being the ones that are involved in themselves and enjoy solitude whereas extroverts to be more inclined to reach out people and activities in the outer world. It was also Jung who proposed the basic functions of dealing and interacting with the world whether a personality is introverted or extroverted; these functions are sensing, intuiting, thinking, feeling, judging and perceiving. He exercised an immense influence on popular psychology, spirituality and new age. He was also a great writer whose works consists of 19 volumes, most of which were translated into English after his death. He died on 6th June 1961. His works are collected in a book titled “The Collected Works of C. G. Jung”. He penned downed another book “Analytical Psychology: Its Theory & Practice” which consists of his lectures and theories.
" Carl Gustav Jung," FamousPsychologists.org, https://www.famouspsychologists.org/carl-gustav-jung/ (accessed April 23, 2019). Carl Gustav Jung [Internet]. FamousPsychologists.org; 2014 [cited 2019 April 23]. Available from: https://www.famouspsychologists.org/carl-gustav-jung/. Carl Gustav Jung, https://www.famouspsychologists.org/carl-gustav-jung/ (last visited April 23, 2019).